Learning How to Make Marshmallow Fluff may seem intimidating, but as long as you have a thermometer and an electric mixer and a few simple ingredients, you can have this made in under 20 minutes and it’s far superior to any store-bought version. This version is made using only honey and maple syrup! Here in the New England area Fluff is so beloved that a local Boston suburb has a festival every year to celebrate the iconic Marshmallow Cream. 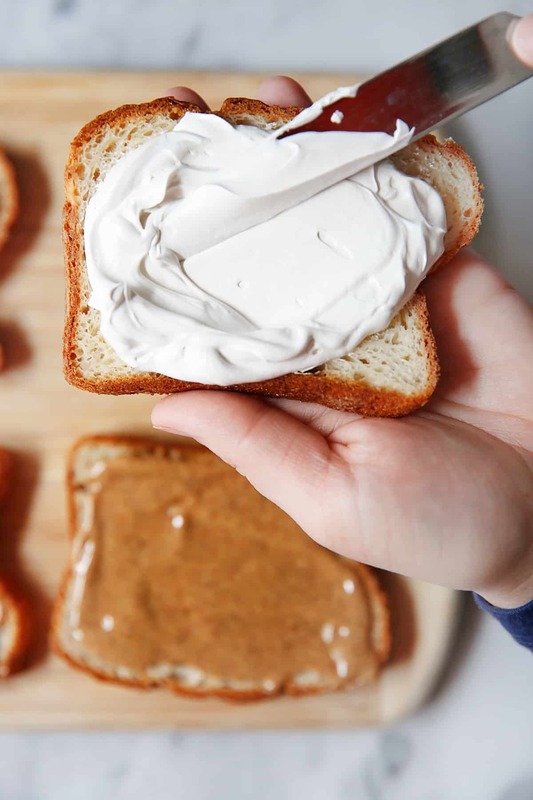 If you haven’t tried Fluff, it’s basically a sticky sweet marshmallow spread that is classically known to be the other half to peanut butter in a Fluffernutter Sandwich and it’s delicious. The bad news is that it’s made with corn syrup and a few other suspect ingredients. The good news, we’ve cracked the code on How to Make Marshmallow Fluff at home because it’s easy and a super fun treat! 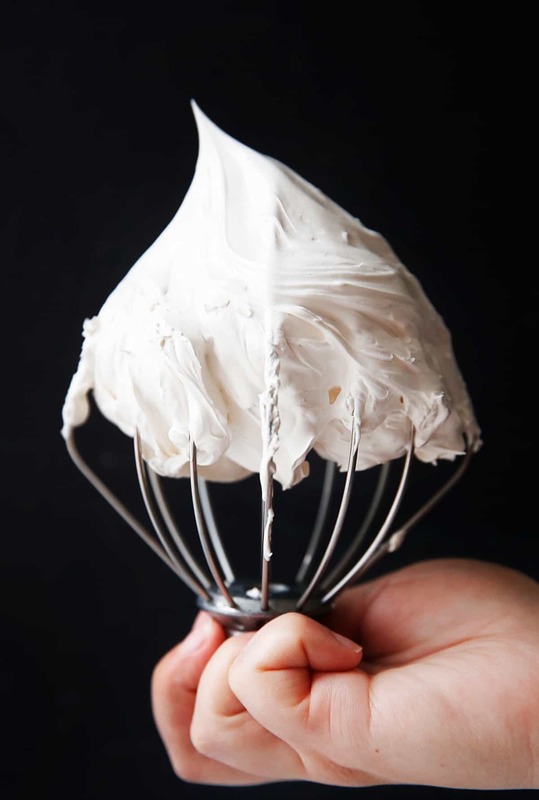 And what makes it even better is making Homemade Marshmallow Fluff at home uses only a few simple ingredients: egg whites, cream of tartar, honey, maple syrup and vanilla! And we promise, it’s really simple! The first thing you need to know about How to Make Marshmallow Fluff is that you are making candy! 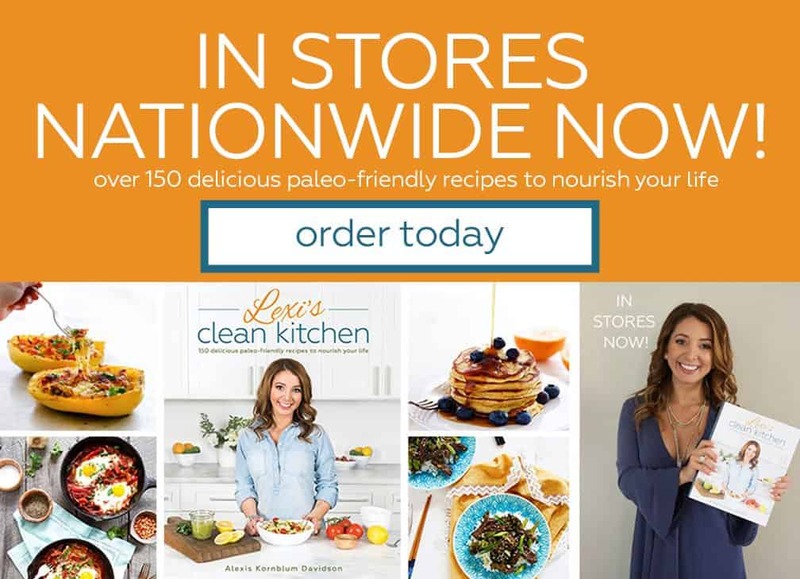 You’ll be cooking up a very hot sugary syrup and then pouring it into beaten egg whites and whipping them up until the whole mixture has transferred into magical Marshmallow Fluff. It’s like a marshmallow without the gelatin to set it. If you are wondering if this is a lot of sugar—it is. You are making candy and one of the principal components of candy is: sugar! If you lower the sugar content it may not work. We orginally tried this recipe with less than ½ cup maple / honey and it failed miserably. We did successfully make it by reducing the honey from 3/4 cup to 1/2 cup, but really liked the stability that this amount of sweetener offered. The bowl and whisk attachment must be cleaned well because if there is any grease in it, it will prevent the egg whites from whipping up properly. Use a large pot in case the sugar boils up high. If it is still coming close to the edge lower the heat a bit. It will take longer to get to the correct temperature but it will still work without boiling over. The added water in the sugar mixture helps the sugar come to a boil without burning. Put the water in the pot first, then the other two sweeteners. Do not stir the pot. Do not move the pot. You run the risk of crystallizing the sugar. If you have one, use a candy thermometer, or you can also use an instant read thermometer. You want your sugar mixture to reach the “soft ball” stage or 235ºF-240ºF. This stage gets it’s name from the fact that if you put a droplet of cold water into the boiling sugar, it will turn into a soft ball. This hot sugar mixture is what cooks the egg whites and turns it into Marshmallow Fluff. Troubleshooting: If the egg white mixture hasn’t thickened up and become glossy, either the sugar syrup was not the proper temperature, or you haven’t whipped the egg whites long enough. So If it isn’t looking thick and glossy, try whipping longer. And of course use a thermometer to make sure the sweetener has boiled enough! You can store the Marshmallow Fluff in an airtight container at room temperature for about 1 week, though we recommend using it within the first 3 days. After a few days the mixture might start to weep, and this is totally normal for Fluff made without any artificial ingredients. All you have to do is re-whip the whole thing until it is glossy and thick again. Do not store your fluff in the refrigerator. This Fluff tastes amazing toasted with a kitchen torch! What recipes can you use this Marshmallow Fluff with? You can’t go wrong with a fluffernutter! 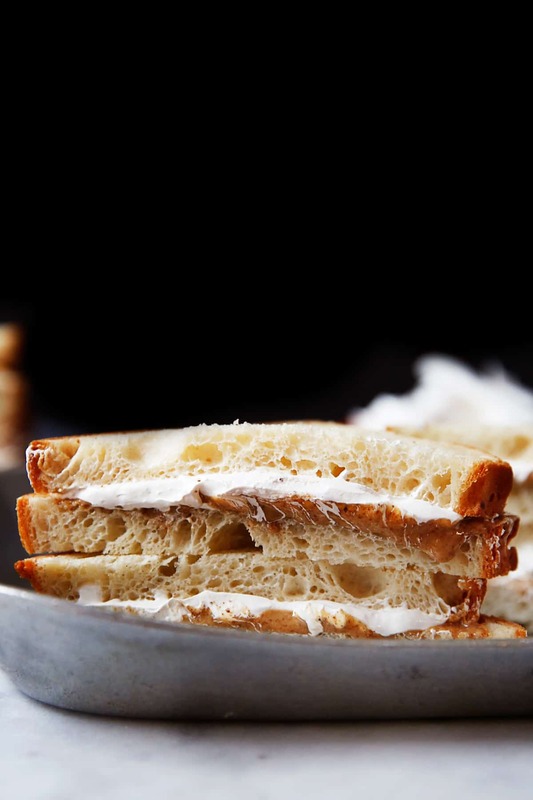 This is a peanutbutter and marshmallow fluff sandwich! Use it in this Gluten Free Hostess Cupcakes recipe. Use it in this S’mores Pie recipe. Use it to make marshmallow cream s’mores. Use it to top any pie! Use it as a frosting on any cake! 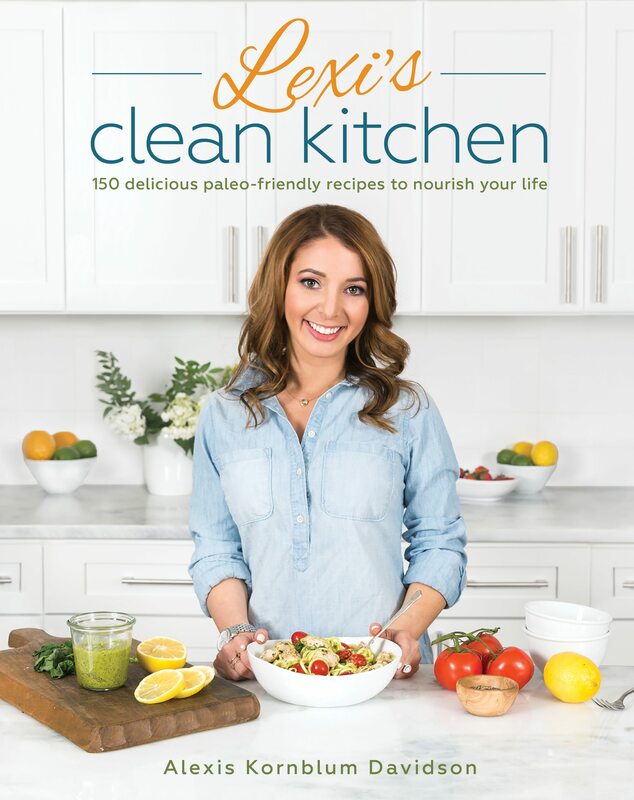 This is a great option because it’s dairy-free! 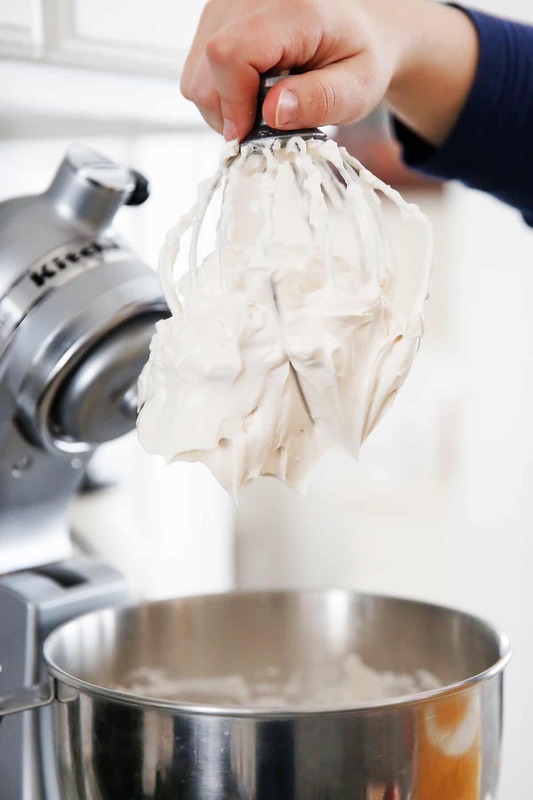 In a clean mixing bowl for an electric mixer with a whisk attachment, add egg whites. In a large pot add water, honey and maple syrup, in that order, being careful not to get any of the mixture on the sides of the pot. Turn the heat to medium and let the sugar mixture cook undisturbed. When the sugar syrup reaches about 225°F, start whipping the egg whites on medium-high speed. Once they have started to get frothy add the cream of tartar and salt. Whip to soft peaks. When the the sugar syrup has reached 240°F, remove from the heat, turn mixer to medium and very slowly and carefully pour the sugar syrup into the egg whites in a thin, steady stream. Aim to get the syrup in between the bowl and the whisk attachment so you don’t spray the hot mixture everywhere. Once all of the syrup is in, increase the speed and continue to whip for 8 minutes, or until the mixture is thick and glossy. Add in vanilla extract and whip for one one more minute. 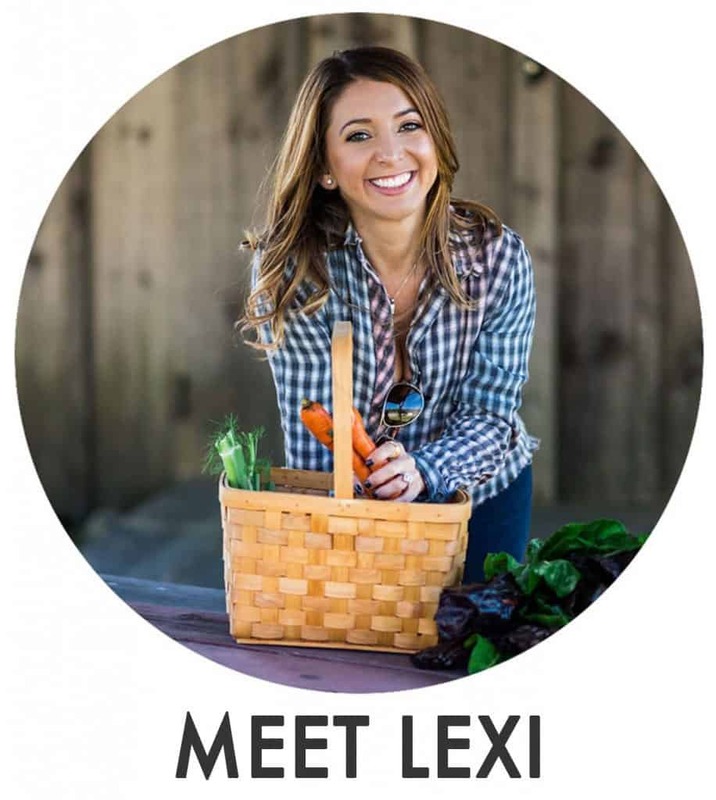 Read through the whole article to get additional tips. 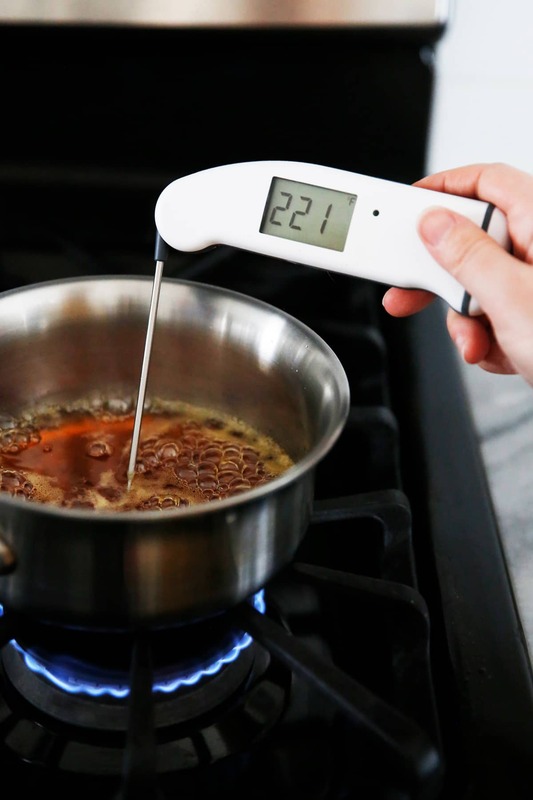 You can use a candy thermometer attached to the pot to monitor the temperature, or an instant read thermometer. Use a large pot to prevent the sugar mixture from boiling over. If it is still boiling close to the edge of the pot lower the heat. It will take longer to come up to the correct temperature, but it will eventually. 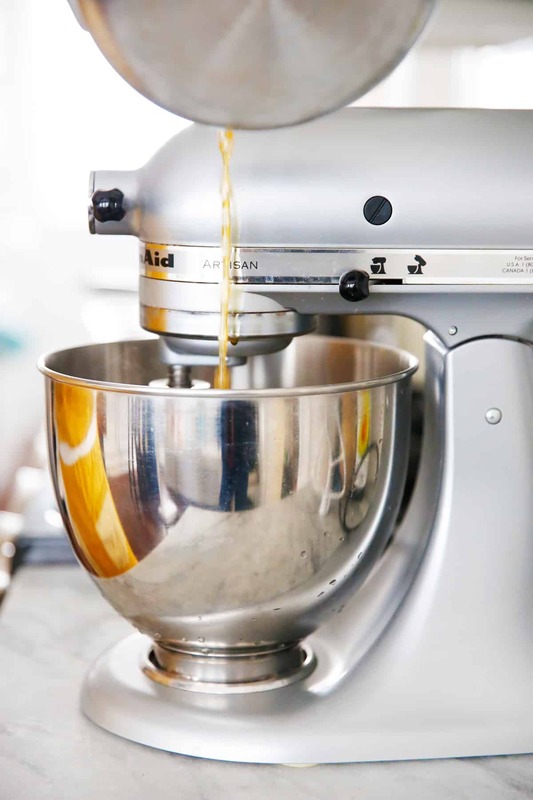 Troubleshooting: If you mixture hasn’t thickened up and become glossy, either the sugar syrup was not the proper temperature, or you haven’t whipped the egg whites long enough. So If it isn’t looking properly try whipping longer to see if that helps.